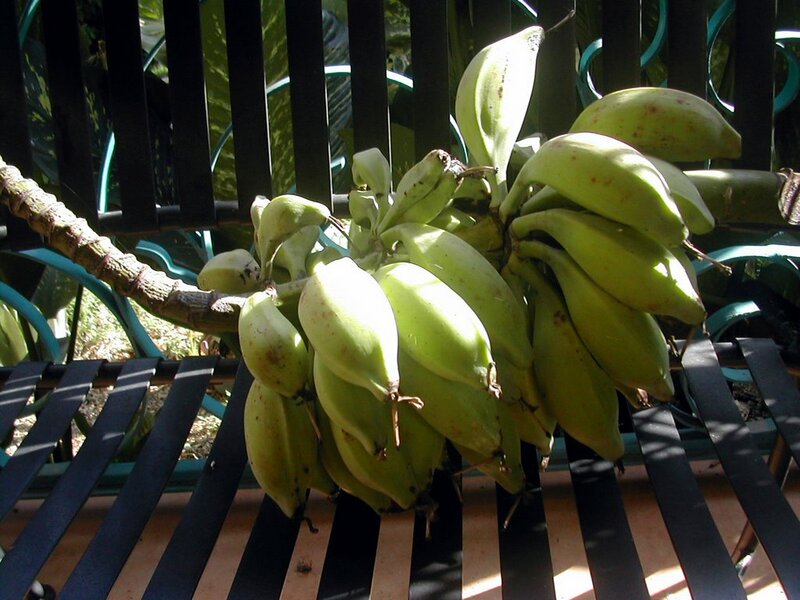 These are some wild bananas that grow on our property. The plants themselves are huge − I would guess 20-25 feet tall (6-7.5 m.). They keep producing 'pups' (new plants from suckers) so the clumps keeps getting bigger and wider. The leaves range from 4 to 8 feet long and about 2 feet wide (1.2 to 2.4 by 0.6 m.), not counting the stalk. 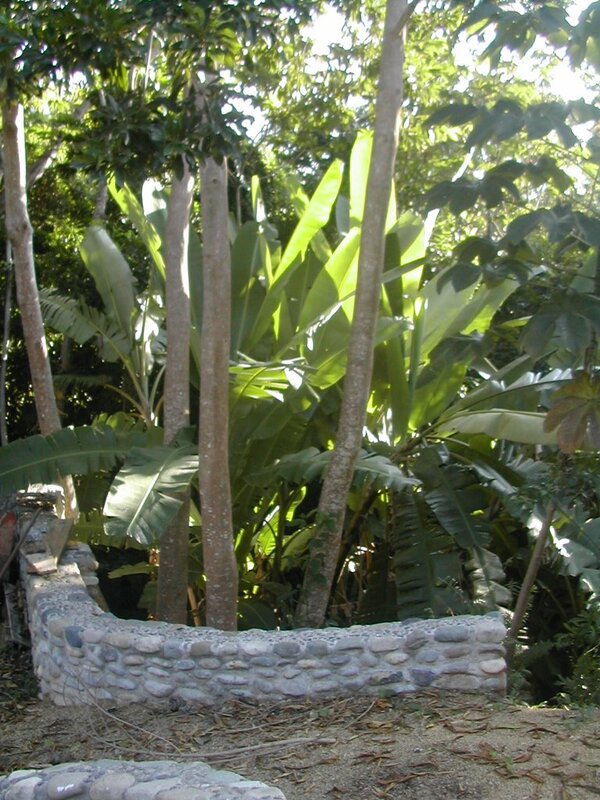 In the north coast of Honduras, banana leaves are used for making tamales instead of corn husks. These bananas are inedible, containing about 50% fruit and 50% seeds. 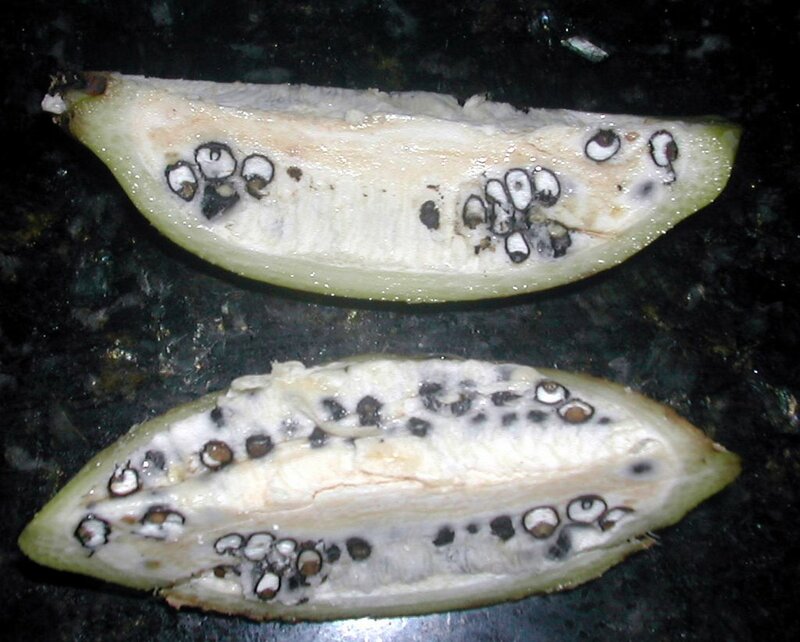 Banana seeds are like rocks. I had a hard time cutting this one in half even with my brand new, very sharp chef's knife. These are only about 4 inches (10 cm.) long but very fat. The first cut didn't really show the extent of the seeds so I quartered it and in the picture on the right you can see the seeds better. Unripe bananas and plantains exude a sticky latex that is very difficult to remove from a knife or your hands. This latex dissipates as the fruit ripens. This is a picture of a banana flower. 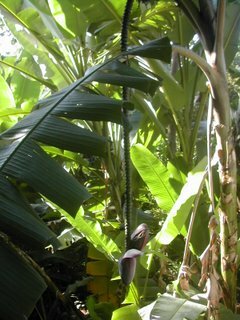 This stem has about 6 ft. (2 m.) between the flower and the bananas, which don't show in the picture. The fruit grows upward from the stem − what we would think of as upside-down. 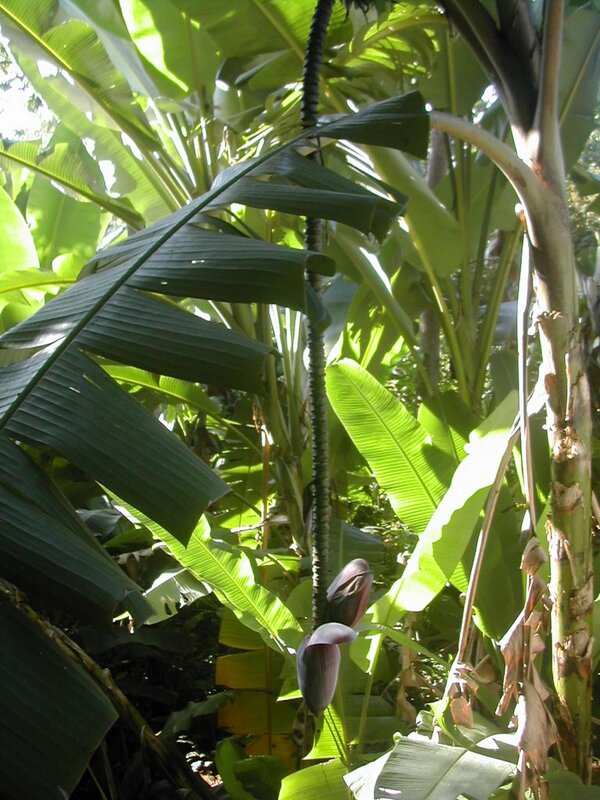 The next picture shows the flower stem of the cut banana stalk. The upward pointing tip is what is left of the flower, which would have been pointed down when attached to the plant. 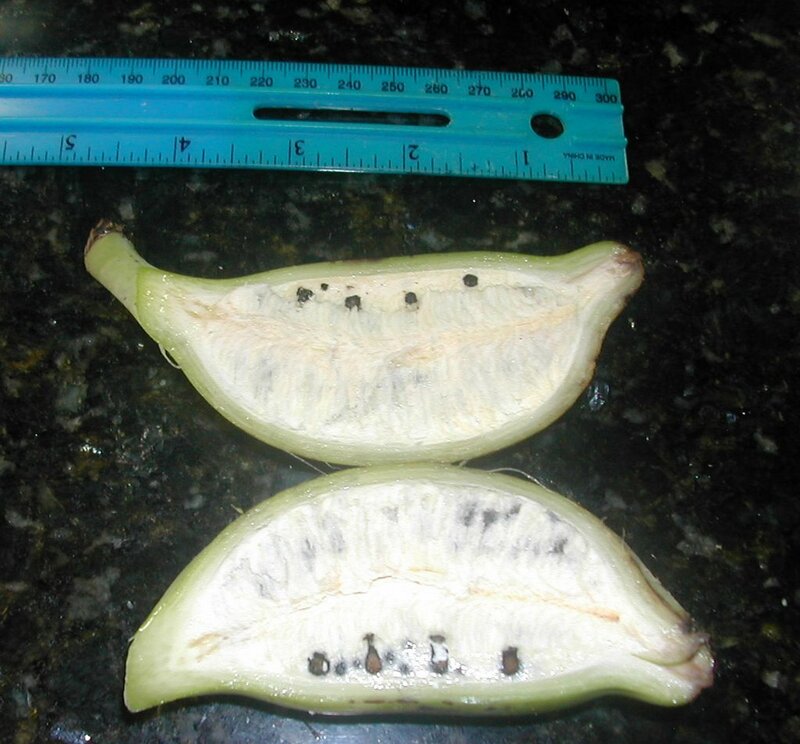 There aren't many bananas on this stem because the plants are so overcrowded and haven't been fertilized and maybe the wild ones just don't produce as much fruit as the cultivated bananas, (called guineos in Honduras). This picture shows some of the wild bananas that were growing here. Everyone wanted to cut those banana trees down! Pretty much everything that doesn't provide fruit or flower suffers the fate of the machete. I didn't want to cut them, of course, because I like the tropical look and at the time we didn't have too much else in the yard. Someone told us recently that these wild bananas can cross pollinate with the 'real' bananas, so I guess it is time to cut them down. I did some research and found that cross pollination is unlikely, but we don't want to take a chance of ruining our edible banana and plantains. We'll chop up the leaves for mulch for our banana plantation. They make a good mulch and provide nutrients to the plants as the leaves break down. 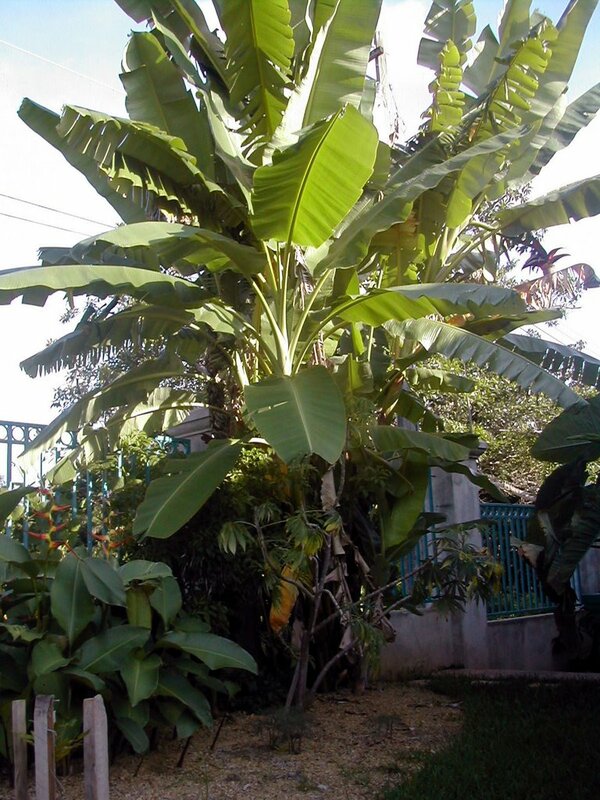 This was one skinny banana plant that I transplanted to the front yard − against everyone's better judgment. Now it is a huge clump and is going to take some work to chop down and remove the roots. I guess they were right. I've read that there are 40 wild banana species (Musa). I don't know what variety these are. El Jefe cut these bananas because we are going to try to feed them to the chickens. 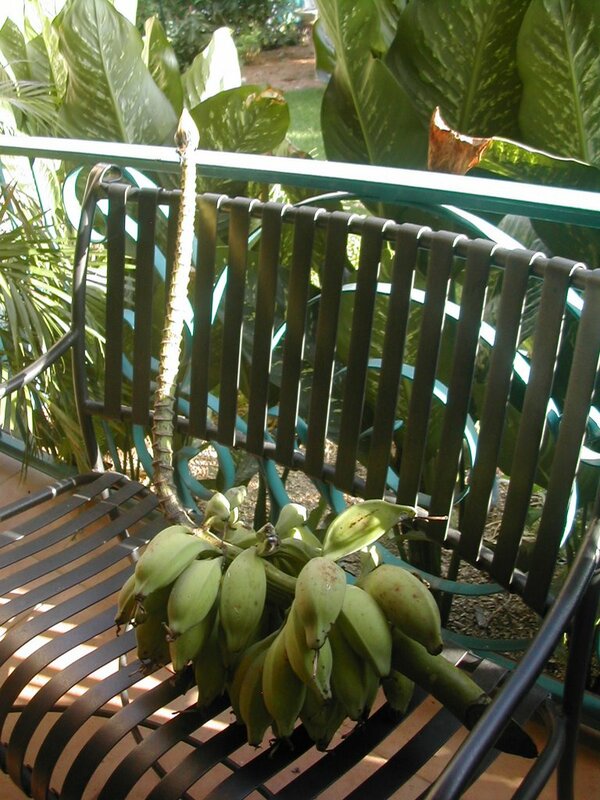 I've found that the chickens do not like wild green bananas so now we'll wait until they ripen and try them again. Or maybe I'll try cooking them for the chickens − Shh! Don't tell anyone. How many hamburgers in the world? 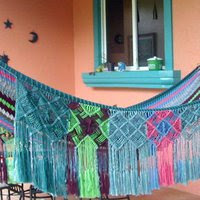 What is the season in Honduras? Why are we in Honduras?